Interesting. I think though, in my case of undiagnosed Celiac and multiple food poisoning episodes, I had leaky gut and poor functioning of the cleansing waves of the small intestine, my diet of occasional meat and pork didn’t help but certainly didn’t cause Hoshimoto’s. BTW- the food poisonings I had were from seafood!! Very interesting Paul, thanks for delving into the emerging evidence for us. I love seafood and would be perfectly happy eating it every day. However, my methyl mercury levels are high and I appear to be a slow mercury detoxifier. I also have low free T3, despite normal free T4. My understanding is that mercury can interfere with the conversion of T4 to T3. Although I don’t have strong symptoms of hypothyroidism (except perhaps insomnia and low body temp), my experience and that of others I have read about would seem to indicate that those with hypothyroidism would have to be careful with the consumption of high mercury ocean fish, along with reducing other mercury exposure of course. Leaves not too much to eat in the way of animal proteins. I guess just eggs and poultry and low mercury fish (no more tuna sushi for a while 😥 )! Thanks Paul – this is really interesting. It may explain why I still have high TPO and TG anti-bodies despite a strict gluten free diet. When I followed an auto-immune paleo diet they fell by about 30% great – but TPO still over 1000. Since my diagnosis 5 years ago, when I was asymptomatic, my thyroid has got progressively damaged and I now need to take daily thyroxin, which I do well on and convert well to T3, so consequently have no hypothyroid symptoms. Dairy and cheese seem to be a trigger for dishydrotic eczema which I get on my hands within 2 – 3 days of eating. I’ve always felt better eating poultry and seafood and eggs for protein, hard to explain – more energy, lighter. Looks like I’ll be doing another experiment with my diet – red meat free. I’ll get some baseline thyroid tests first though. I’ve just got my thyroid retests, prior to the red meat free challenge my TPO antibodies were 465, (down from a high of 1600 a few years ago). Dairy free seems to help. After 3 months of using almost only poultry and fish and eggs as my protein they are down to 385 so an improvement, but still high. I’ve been on a stable dose of thyroxine for the last 3 years so my thyroid function seems to be stable and not deteriorating. If the red meat can provoke an auto-immune reaction, could it possibly be the cause of psoriasis as well? I think that is unlike, but who knows. 🙂 Psoriasis works differently than Hashimoto: http://f1000.com/prime/reports/b/2/40/ keratin is attacked by the immune system and the IL17/23 axis is impaired because of genetic mutations. Sunbath can be a release, it downregulates that pathway. And there are new IL23 blockers which can help too. This is very interesting. I too went gluten free six years ago after my Hashimoto’s diagnosis but my antibodies did not change. I went on Gaps twice and still no change in how I was feeling. The only thing that did change was my intake of organic red meat, pork and raw dairy. I now also have Graves. I wonder if this could be a big piece of the puzzle? Just this week it occurred to me I’ve been forcing myself to eat red meat or lamb when not only do I not care for it, but feel it may be somewhat constipating. Red meat is so integral to the Paleo diet, that I’ve been including it only because it is said to be so healthy and essential. I’m going to leave it out for awhile, and stick to my fish and some chicken. I don’t eat much more than 6 ounces or so per day anyway. I’ve also been taking selenium daily – I feel better when I do, selenium can bring anti-bodies down too. Juliane, I think the correlation between symptoms (their severity) and antibody levels is stronger for TPO than it is for TG. And even for TPO, it could be off due to delayed or lagging response or for other reasons that we don’t fully understand. In fact, reading the article cited by Paul, it seems that Neu5Gc IgG is a better biomarker than either one and could certainly replace TG, which has always been a bit iffy. And yes, I agree, most people I know saw their symptoms improve going dairy-free and I don’t think it’s due to the placebo effect. Thanks for the great research and analysis. I have a question. Is neu5gc found in fats as well? Would an autoimmune elimination diet still get to use ghee or beef tallow? Is it specifically the proteins that need to be eliminated, or the fats as well? It’s found on cells and extracellular matrix. Butter should be fairly safe, definitely clarified butter/ghee would be. Would bone broth from chicken therefore be preferred to those at risk compared to bone broth from cattle? It would be a good reason to use the chicken feet my butcher gives away for free! Thanks in advance for your assistance. Do you think Neu5gc is found in Armour and other NDT medications? I don’t know. It would be a good question to ask the manufacturer. I had the same question, I cannot find any info about how these medicals are produced. There is about 3-4% in salmon and dairy (except goat milk products) and 20-40% in red meat and goat milk products. http://www.ncbi.nlm.nih.gov/pmc/articles/PMC218710/bin/pnas_2131556100v2_index.html I think fat has a high content too, since it was made from fat cells, which have cell surface sialic acid too. Is it possible to be tested for levels of anti-Neu5Gc antibodies? And does it seem just as possible that Neu5Gc could play a role in the development of autoimmune diabetes? As a type 1 diabetic, I’m always looking for answers. So if those of us with autoimmune diseases (I also have moderately high TPO and TG antibodies, as type 1s often do), if possible, would it make sense to first test for anti-Neu5Gc antibodies before altering diet? Another question- I’ve read somewhere (I can find it if anyone wants to know) that vaccines often were cultured in or maybe even contain traces of various animal elements (cultured in bovine serum, chicken embryo, etc). I have absolutely no idea and no special training to be drawing any conclusions about this but it just popped into my head. I don’t know the mechanism of how vaccines work but is it possible that they could contain traces of Neu5Gc and possibly be another source of autoimmunity? Not sure if that’s even possible…?? Please enlighten me on this in case I’m way off with this thought. Also- where’s Mario Iwakura’s comment on this?? Very curious what he makes of this! Thanks for sharing your research and insights here with all of us Paul! Actually egg is safe, but vaccines can contain beef related things, so you are right, they can contain Neu5Gc as well. This is interesting, maybe vaccines are not as safe as they claim. 😀 Btw. the basic mechanism behind them is add a low amount of toxic material, which causes some cell death in the vicinity. This alerts the immune system which find the fragments of the pathogen which causes a B-cell response which will result in memory B-cells. In theory they can find Neu5Gc too and develop antibodies against it, which can cause Hashimoto, but this is just theory without evidence. Actually there is genetic defect in every autoimmune disease as far as I know. I read in depth about 15 so far. Glad to hear ghee is safe! Phew. How about Great Lakes Gelatin? Interesting article thank you. Do you think bone broth from these animals would still be ok ? Paul amazing analysis, as always. Thank you! This is really overwhelming! I am in a bit of shock though! 1) Does this study influences the PHD recommendation? 2) How should one address the red meat in the diet? Should one cut red meat all together? Should one reduced to a few times per week? 3) What are your suggestions to both people with autoimmune disease and for people that do not suffer from autoimmune? 4) Does this mean that, for people that do not suffer from autoimmune disease, the consumption of red meat could eventually make then autoimmune? Sorry for all the questions. At this moment I am confused about the type of meat (if any) I should consume. Thanks very much for this series. I’ve learned a lot. Hashimoto’s aside, I still wonder, should mammalian foods / food products be reduced simply due to the increase cancer/CVD risk of inflammatory neu5gc? The idea that this molecule gets incorporated into human tissue and causes a continual inflammation (for what duration?) is worrisome. Do you think the effect is strong enough to change any of your dietary recommendations? Regarding the recent study that triggered this discussion — you mentioned it was an artificial scenario — I tend to agree, but could you elaborate? It’s not inflammatory unless you have anti-Neu5Gc antibodies, and you need certain gut bacteria to get the antibodies. I think ultimately we want to have clinical testing for anti-Neu5Gc antibodies and cut down on red meat if you do have them, cut down more if the titers are higher. For now, I think we can say that Hashimoto’s patients should cut down on red meat. I’m not sure it makes sense to go any further. By “certain gut bacteria”, do you generally mean certain large intestinal flora, or certain small intestinal flora? Also, do we know anything (beyond the list of Neu5Ac-incorporating bacteria you gave in the first part of this series) about which genera of gut bacteria would be responsible? It’s probably most often small intestinal flora, or even respiratory tract (mouth, esophagus) bacteria. Possibly it should be described as an infection. No, there doesn’t seem to have been much investigation on this topic. But poultry and seafood’s are higher in polyunsaturated fats, which in higher doses are inflammator, even omega 3s can be taken to excess. There seems to be a catch22 here. Any I know an ex vegan who’d love to know if sticking to fish and poultry are preferred over red meats. What about… goat? Goat is a ruminant like beef or lamb. Fish and poultry are preferred in terms of autoimmunity, but fish and ruminants are preferred for fatty acid composition. So pescetarian may be the optimum. Please could you give your point of view on the heavy metals contained in fish for pescetarian ? And how to get rid of heavy metals (if it’s possible). I think if you try not to eat excess omega3 and keep the recommended omega3-omega6 ratio, it is okay. You can add omega3 with olives and flax seed if you don’t want seafood high in heavy metals. Flax seed is a goitrogen, so maybe you don’t need that. Sometimes it is better to know less. 😀 Btw. if you don’t have thyroid problems, you don’t need this kind of diet. I have Hashimoto s and other symptoms including tremors. I always thought my Hashi’s was, for the most part, under control and a non issue. I began keeping a food journal during a downturn in my health and realized I felt weak and more tremorous after eating beef and pork; pork seems to be worse. IGG food testing did not pick either of these up., although chicken did show up. Beef and pork do not cause any obvious GI discomfort; chicken does. I am eating mostly fish along with lamb, turkey and duck right now. The AIP has been helpful and harmful, possibly because it has been too low carb, resulting in too rapid weight loss. I’m exploring PHD, although, I have so many true sensitivities that it’s hard to implement any diet perfectly. Tremor can be caused by vitamin B deficiency. Try out vitB, vitD, Zn, Se supplementation. These made me feel better. Another triggers are mold spores by me. I used to have black mold on the insulation of my window which worsened the symptoms. After rereading this post, I’m feeling stunned. I recognize the research you cited is still preliminary. However, I feel that it may hold some answers for me. I’ don’t want to exclude all red meat from my diet without being tested for anti-Neu5gc antibodies. It has been several months since I made the connection between beef and pork and the exacerbation of my symptoms. I recently crashed after about 10 days on AIP. After listening to your podcast on Phoenix Helix, I recognized how low carb my diet was. I’m making necessary changes and starting to feel a little stronger. Do I simply ask her to test for anti-Neu5Gc antibodies? Is there other blood work that should be ordered with it ? I’m waiting on test results now (7 vials worth of blood)so, some of it will already be covered. Makes me wonder if this would have any implications for the use of Armour thyroid as it is derived from pigs. just curious– is vegetarianism ever right for anyone? for specific conditons? “just curious– is vegetarianism ever right for anyone?” – It is hard to tell. This is interesting, because the Pagano psoriasis diet, which a lot of people claim is effective if followed carefully, is basically removing nightshades, red meat, sugar and a few other items. I have psoriasis and I tried a modified paleo or PHD version of this diet without success. Basically it was PHD without nightshades, I ate a lot of red meat because that’s what the PHD recommends, and I figured that Pagano’s restrictions to fish and fowl were nonsense. Red meat is good for you, etc. So it’s interesting that there could be something to that restriction to chicken and fish, and that these new potential recommendations for Hashimoto’s mirror old recommendations for another autoimmune disease. Anyway, I’ll now try a stricter version of the paleoized version of the Pagano diet. This is truly an eye-opening post. We’ve been hearing about Neu5Gc and cancer but not about the connection with autoimmune hypothyroidism. But like the research article (Eleftheriou et al) says, it’s not clear whether Neu5Gc is a “causative factor” or a “parallel result” of the onset of Hashimoto’s. This could be like high BCAA levels prior to diabetes onset (presumably parallel rather than causative). Or it could be like the predominance of provotella copri in gut flora prior to RA (causative at least for the inflammation phase of RA). Plus, there seem to be some questionable facts or errors in the article: (1) Table 3 (p. 4) may have switched medians for minimums — these numbers just don’t make sense, e.g., the median for Hashimoto’s can’t be 0.1; (2) Hashimoto’s accounts for far more than 50% of hypothyroidism, even in a maritime country like Greece where excess Iodine intake may trigger many non-autoimmune hypo cases; (3) RA antibody ACPA is seen in >95% of patients and is very accurate, not ~67% – that would be more like for RF only; (4) the non-normal distribution for females is not due to the predominance of subclinical hypo but because Neu5Gc skyrockets in symptomatic cases of Hashimoto’s, as in a lognormal right tail distribution. But what gives strength to the argument is the staggering association with Hashimoto’s and sheer correlation between Neu5GC and TPO (Figure 2). There’s actually higher correlation for Hashimoto’s with IgG Neu5Gc than with either TPO or TG (Neu5Gc might as well debut as an official antibody and replace TG, the weaker biomarker). 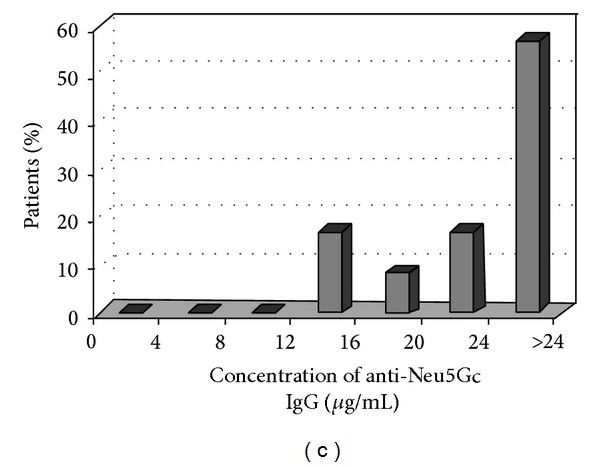 And the finding about IgM Neu5Gc going up while IgA remains low, suggestive of “compensating” for the impaired IgA defense by IgM and IgG; immunodeficiency may be part of all this. Congrats on another insightful article, Paul. Given your diet, such a finding may not be welcoming. However, you’re concerned only with letting the data speak for itself, something which we can’t say for many in the Paleosphere with their skin in the game. Your integrity indisputable. This is intriguing. I quit eating red meat and pork about 30 years before I was diagnosed with Hashimoto’s, and I think I’ve had lamb once in my life. I read various bloggers who claim to have “reversed” Hashimoto’s on different diets. I realize that you have to figure out what works for your body, but it would be good to find the common denominators in diets that help Hashimoto’s patients. I’m a 30 year old male, been paleo (thanks to you) for 4 years, and was diagnosed with severe Hashimoto’s a decade ago. I’ve now avoided mammal meat for 6 days and it’s the biggest improvement in health since starting to eat larger amounts of fat. Bloating is reduced, energy is up, muscle fatigue is way down, lust for life is coming back, and so far perfect BMs. The “health buffer” is improving each day and just to jerk some tears I can hold my 4 month old baby girl without putting her down every 5 minutes. Please, continue to add value to people’s lives. I hope to meet you someday. Be well and thanks again! Paul, I’m having a similiar experience to what Craig described. I’ve been off mammal meat now for going on a week and the improvement in how I’m feeling is dramatic. I can’t thank you enough for your help. Please forgive my ignorance, but are properly prepared beans okay for hashis? I’m considering cutting out red meat after reading this, and really need to get some protein sources figured out (along with RS, etc). Thanks in advance! Hi Kati, I would go with seafood, freshwater fish, and birds (chicken, duck) as my main protein sources, but lentils, split peas, and possibly beans are acceptable on PHD with long soaking followed by thorough cooking in a pressure cooker. If you’re going further down the list of acceptable legumes than lentils and split peas, wouldn’t hulled cowpeas (e.g. yellow mung beans) be preferable to beans? They appear to be lower in saponins, isoflavones, and other heat-stable antinutrients. Also: Wouldn’t hulled lentils (e.g. red lentils) be preferable to unhulled lentils? I read this and it is interesting, but I am wondering if you can make a leap of judgement here. I was at the endocrinologist today and I have very high Grave’s antibodies. I had radioactive iodine, but during my pregnancy began to produce these antibodies again, and as my doctor stated, decided not clear themselves these past five years. I do have an immunodeficiency which leads me to think I can be more susceptible to gut bacteria. Since I am hypothyroid post ablation, with high graves antibodies, is this enough reason to stop eating red meat? I haven’t seen evidence linking red meat to Graves, but I think it could be worth an experiment. Try it for a month and see if you feel better. If you have a good source of seafood it shouldn’t be too arduous. A month should be enough to let antibodies go down, if the red meat is involved. this is very interesting. I’m wondering if there is any research in what was first, the Hashimoto or the Neu5Gc- Antibodies. Or is this a hen-egg question? This is facinating especially because it makes sense with a recent client of mine, who had Hashimotos and reversed it by eating precisely according to the PHD with not too much red meat but more fish and foul. And she no longer requires Thyroid medication and her blood work came back normal after one year! Thanks Paul! 1. 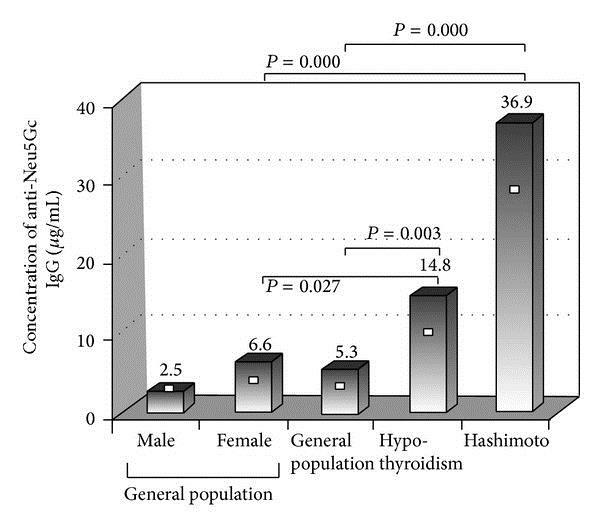 Do we see Hashimoto’s frequently in hunter-gatherer populations who eat lots of mammalian meat? 2. 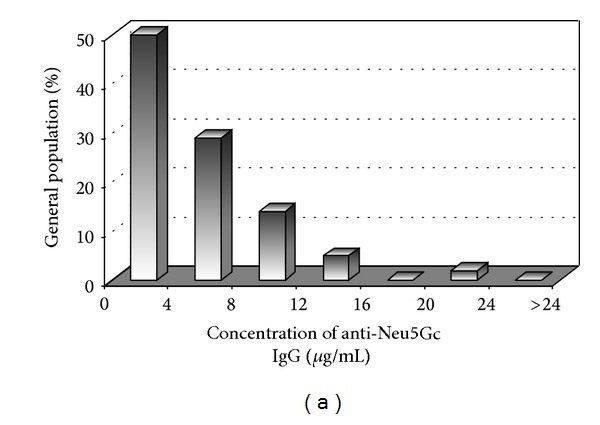 Do vegetarians and vegans with Hashimoto’s have similarly high levels of Neu5Gc antibodies? If so, where is it coming from since it’s not coming from red meat? Yes, excellent questions. I’m not aware that anyone knows the answers. Hello all, I am not sure if this is the correct post to put this question but here goes. I am thinking of switching from Levothyroxine to Armour and I’m in the UK. Has anyone any advice you can give me please? My advice – don’t switch; combine the Armour and levothyroxine, reducing the dose of levothyroxine as you add in a small amount of Armour. thanks Paul, that’s very useful. Am I right in that Armour contains both T4 and T3 whereas Levothyroxine contains only T4 and one time you recommended me to take some T3 also which is impossible to get in the UK. So I concluded it may be better to switch to Armour as it is more nature. Useful to know to switch slowly though. Shaz, I can’t and won’t have made any such recommendations. Some people benefit from a bit of T3 in addition to their T4, for most it’s unnecessary and liable to do harm. Only your doctor can make recommendations in regard to T3. Regardless, if you do take T3, you should experiment to find the lowest dose that relieves your symptoms. Overdosing T3 is a major problem. Also, Armour has too high a ratio of T3 to T4, so don’t take it alone. Doctors don’t like Armour because the doses can vary from batch to batch. They focus on T4 because it is the only thyroid hormone that is made exclusively by your thyroid. T3 is made from T4 and happens both in the thyroid and outside the thyroid. Since TSH goes down (the hormone that requests T4 from the thyroid) when T4 is supplemented, even synthetic T4, most doctors are primarily interested in giving you the right dose of T4 so that TSH will be within acceptable range, and trusting your other organs to synthesize the T3. At the same time, the thyroid does produce T3 and to have a thyroid that can’t function fully like one suffering from Hashimoto’s, you will lose some ability to make T3. Yet this is where you balance the goals of accurately keeping TSH down and making sure you have enough T3. So when it comes to treating symptoms, it makes sense to see if some T3 supplementation (like with Armour) makes you feel better, but like Paul said, not by eliminating synthetic T4 supplementation. As far as my personal recommendation, avoid brand name Synthroid. They cannot guarantee their product is gluten free. Many generic levothyroxines can, so call your pharmacy and hey will be able to tell you. thank you Ben and Paul for your helpful comments. I am 64. I was diagnosed with lupus when I was 29. I had Hashimoto disease when I was 44. My thyroid was killed. What diet would you recommend? I would recommend our diet, but with less beef, lamb, and pork and more fish, seafood, chicken, and duck. This is very interesting post. How neu5gc antibodies relate to hashimotos antibodies? Are you saying that beu5gc gets into thyroid tissue and both too and anti neu5gc antibodies are created causing further thyroid damage? If somebody has tpo antibodies but no symptoms how your theory could be tested? Should one test for tpo stop eating meat and test again after month? Do you recommend to stop eating meat completely or just limit it to let’s say once a week? 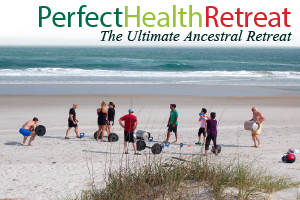 Why the functional medicine doctors don’t talk about neu5gc? It seems like you are one of the only ones that mentioned this topic. It’s about a year old topic and a single article is not enough. We are waiting for other articles and studies which confirm that mammalian product free diet keeps people symptom free in Hashimoto’s disease. So lets say Neu5gc has a connection to Hashimotos. Would removing mammal meats got rid of thyroid antibodies? Do you recommend to stop eating meat at all or 1 a week is ok? How about diary? If antibodies would disappear would it be possible to reintroduce mammal meats at later time? Completely off topic, but I don’t know where else to ask. What’s the word on GMO foods, specifically salmon? Everyone around her going postal on the subject. The media is doing what they always do, create another crisis. I assume you’re referring to “AquAdvantage salmon”? In that case: The genetic engineering is intended to increase growth rate by adding genes from other fish species which control growth hormone levels. This is probably much safer than, say, genetic engineering intended to increase toxicity to pests by adding in genes from other species which code for toxic proteins! Eric, thanks for the reply, but are you saying yes, the salmon is okay for us geezers or it’s not as bad as it could be? It’s about a third of the price as the other kinds of salmon, a very popular feature here in retirementland. My guess is that it’s okay (although I don’t know with 100% certainty). I would probably eat it, unless someone I trust (like Paul) raised a credible objection. Just to further clarify: I’m not saying the GMO salmon is just as good as fresh wild-caught salmon… Rather, my guess is that it’s a sensible compromise given the massive price reduction. Thanks Eric. You have reassured the 80 somethings around here that it’s safe-ish. Perhaps Paul will do a post on GMO since it’s so much in the news now. As for wild-caught, I remember some years ago that there was scare about mercury in swordfish and also concerns about pollutants in lobsters, cod, tuna and other ocean going fish? It is really difficult to know what to believe now that scientific research has become a follow-the-money operation. It would be great if Paul were put in charge, so we could have complete trust in what we see in the media. I’m glad I could provide some reassurance. The concern with wild-caught fish is primarily for fish high on the food chain (like swordfish, tuna, etc.). It’s not much of a worry for salmon. 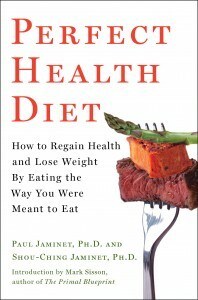 I have Hashimoto’s and have been planning on following the AIP, but am conflicted since I’ve read this. To follow that protocol without red meat would be terribly hard. Is it enough to eat PHD and only exclude red meat + dairy but still include nuts, eggs, nightshades and ghee? I would prefer to do this version of the PHD instead of the AIP, but if I have to I guess I could do a combination. Is it important to exclude eggs, nightshades and nuts as well if you have Hashimoto’s? Yes, I would favor PHD without mammalian meats over AIP. There is no reason to exclude egg yolks, nightshades or nuts unless you have a sensitivity reaction to them. Thank you so much, Paul! I will do that then, can’t wait to see how it goes. I’m not feeling all too well at the moment. A second question, my sister-in-law has lichen sclerosus and polyneuropathy (feet), would she benefit from following this protocol or does she need to do the AIP or simply the regular PHD? I would recommend that she follow the regular PHD for a few months, and then consider tweaks to see if they help. PHD is a good baseline to adopt before experimenting. That’s great! I will tell her. Thank you for your advice! When people say they feel better when they stop eating “red meat”, it’s hard to know why they got that result. Factory-raised meat contains contaminants and is not as health as 100% grass-fed meat. Many people feel better when they switch from factory-raised to grass-fed red meat. 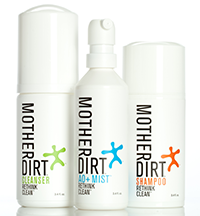 Another confounder is mold contamination. We live in the San Francisco Bay Area, and this winter all the locally-raised red meat we’ve tried, from multiple farmers, has high levels of mold contamination, probably because of the large amount of rain and small numbers of processing plants. We’ve started buying mail-order to get red meat that we can eat without feeling bad afterwards. The local chicken we’ve tried didn’t have this problem, but was a very small sample. We really need clarity on the meat source and possible confounders; to blame all of the negative effects of red meat on Neu5Gc seems unwarranted, given the strong possibility of confounding by contaminants. I ate red meat and pork (sausages, hamburgers, steak) almost everyday for six weeks this past summer. We barbequed almost everything and without realizing it, I noticed my Hashi symptoms improved. That’s right. Improved. By a lot. I also had beer with those meals. And I ate bread and buns and butter, too. I also ate seeweed, Nori sheets, a few times a week. I had very little falling hair, which is my signal that the Hashi’s is being kept at bay. Since then I tapered off the meat, and now have the Hashi’s storm back. A German article I read on Hashimoto’s says iron is important. I started thinking that my heavy meat diet with pork offered a combo of iron and high selenium and iodine. I am going to experiment now, and will go back to eating more beef and pork and see what happens. I also find that taking Selenium supplements makes my hair fall out more after a few days. Over a year ago, I also stopped taking replacement thyroid hormone because it made everything worse. I should also say that my thyroid numbers are borderline, but I have high antibodies. I didn’t check the antibodies after the summer. Maybe should have. Anyway, that’s my experience with beef and pork.